When I reviewed a book awhile back, someone PM'd me and suggested I read a book series called Kissed By An Angel. The YA books came out in the mid-1990's (LOL, which is ironically when I was a YA). 1) It's about angels and I love angel stories. 2) Angels are one of the few supernatural beings that I'm not writing about in my original story. I figured it'd be a safe read. I don't like to read stories that deal with the same themes I'm writing, so I avoid them until my own projects are done. 3) The three books in the trilogy are already published and you can buy them as one big book. When her boyfriend, Tristan, died, Ivy thought she'd lost everything, even her faith in angels. But now she's discovered that he's her guardian angel — his presence so strong that she can feel the touch of his hand, the beat of his heart. Ivy needs Tristan now more than ever because he knows she's in terrible danger. Only Ivy's guardian angel can save her now that his killer is after her. I really enjoyed the books. The pacing was good, it was a light, easy read, and it even made me cry a couple of times. I wish the author would have spent some more time building the relationship between Tristan and Ivy before she killed him, and Ivy seemed a bit fickle in her feelings at times, but those were the biggest problems I had with it. This was a story that kept my attention. When I knew I had other things to do, I kept thinking about the book and wanted to continue reading it. That's always a good sign that I'm liking what I'm reading. Now, interestingly enough, apparently the trilogy has been doing really well lately (even though they came out over fifteen years ago). Because of it's recent popularity, the author has decided to revisit the storyline and will be coming out with a fourth book in March. I read the synopsis for it and I think I might pass. The story was so beautifully wrapped in the end of the third story, I really don't think it needs a fourth telling. For my next book, I've decided to read Shades of Atlantis. Shiver and Dark Lover will have to wait. They're both parts of an ongoing series (meaning I'd have to go out and buy more books), and I don't have time right now to give them the commitment they're going to need. 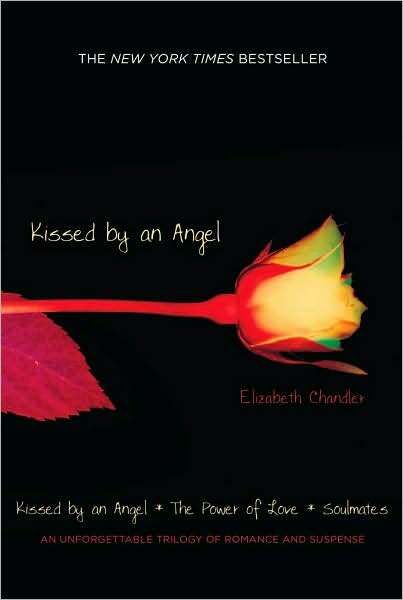 As for Kissed By An Angel, it's definitely a book trilogy I'd recommend.